For the purpose of the Data Protection Act 1998 (the Act), the data controller is Cornwall Oven Cleaning, 98 Tremenheere Ave, Helston, Cornwall TR13 8TR. We will only pass on your personal information to third parties if it is an essential part of trading with you (i.e. passing on your name and address to our carriers, or telephone number should there be a query with delivery). We will not rent or sell your name, address, email address, or any other personal information to any unrelated third party. “cookies” (not the food) is a technology which may be used by us to provide you with, for example, customised information from our website. A cookie is an element of data that a website can send to your browser which may then store it on your system. If you wish, you can usually adjust your browser so that your computer does not accept cookies. Please remember cookies do not contain confidential information such as your home address, telephone number or credit card details. We do not exchange cookies with any third party websites or external data suppliers. We monitor customer traffic on an aggregate basis using cookies and code, which is embedded, in the site. This provides statistical information about visits to pages on the site, the duration of individual page view, paths taken by visitors through the site, data on visitors screen settings and other general information. You may have the opportunity to subscribe to other areas of the site. For instance you may wish to receive our newsletter or other marketing information (by E-Mail or Direct Mail) or enter competitions. In these circumstances we will ask for additional information, such as your age, occupation, style interests etc. This will help us to target our marketing in a way we feel would be of specific interest to you. We may from time to time send with your ordered products, inserts advertising the goods or services of unrelated third party companies. However, we do not pass on your personal data to these third party companies. You are entitled to see the information held about you and you may ask us to make any necessary changes to ensure that it is accurate and kept up to date. 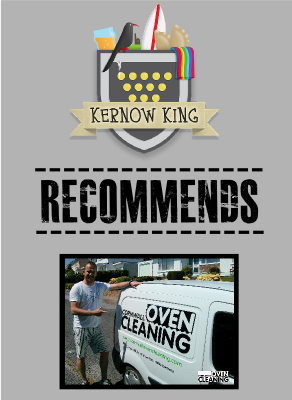 If you wish to do this, please write to us a Cornwall Oven Cleaning, 98 Tremenheere Ave, Helston, Cornwall, TR13 8TR. We are entitled by law to charge a fee of £10 to meet our costs in providing you with details of the information we hold about you.